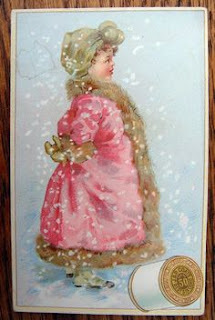 Homespun Stitchworks..... For the love of vintage: History of sewing trade cards ......and they were beautiful! 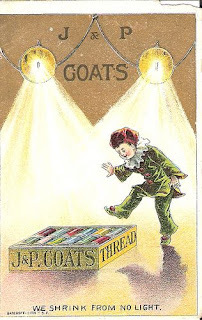 History of sewing trade cards ......and they were beautiful! Sewing machines and thread were heavily advertised during the late 1800's and, as might be expected, women were the primary target. 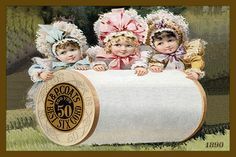 Trade cards advertising sewing machines usually stressed quietness and ease of use, and thread trade cards frequently showed the thread being used in a fantasy scene which emphasizes its strength. Trade card describes small square cards, bigger than the modern visiting cards exchanged in social circles, that businesses would distribute to clients and potential customers. Trade cards first became popular at the end of the 17th century in Paris , Lyon and London. These functioned as advertising and also as maps , directing the public to merchants' stores, as no formal street address numbering system existed at the time. The trade card is an early example of the modern business card . Some businesses began to create increasingly sophisticated designs, especially with the development of color printing. A few companies specialized in producing stock cards, usually with an image on one side and space on the other side for the business to add its own information. As the designs became more attractive and colourful, collecting trade cards became a popular hobby in the late 19 th century, since colour images were not yet widely available. This is what I have been looking for on my travels as well and I will report back to you when I am home. I have to write these blogs and then think of time difference which is a little tricky sometimes so I am saving up details of this adventure for when I return. I think you will agree some of the cards are stunning. I do have two at home with birds on and one with a little girl already. Well I will leave you with these thoughts and I only have a little more time on my antique trail so I must away and see what I can find to bring home. Some of which will be for sale at the Vintage Bazaar in Frome.